Black Diamond is the perfect Eagle transportation company for you! 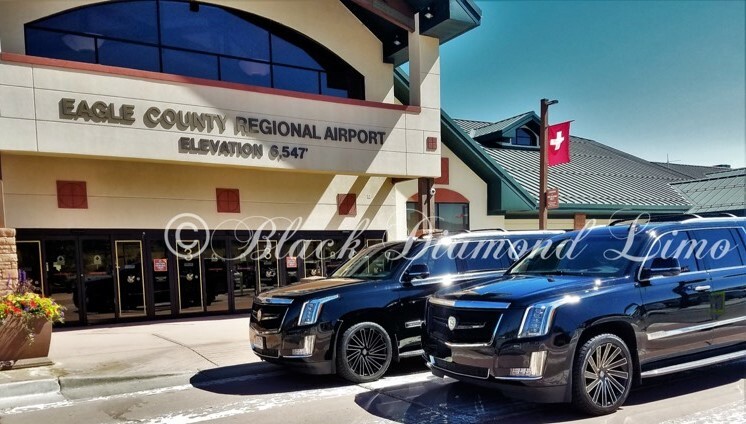 Whether you are flying into Vail-Eagle Airport for vacation, business, or a special event, Black Diamond Cars will be there to provide transportation from Eagle County Airport to Vail and beyond. Allow us to be your Vail Airport shuttle and arrive at your destination safely, efficiently, and in style. * Driver's gra tuity is not included and 20% will be added to all fare * Our luxury vehicles seat up to 14 passengers with luggage and skis * Complimentary TV | DVD Movies | SIRIUS XM | Bottled Water * Child Seats are available on request at no extra charge * Rates are for One Way trips per entire private vehicle, not per person Your Driver will meet you next to the baggage claim at the Vail-Eagle Airport Ground Transportation Meet & Greet area. He will hold a sign with your name on it.